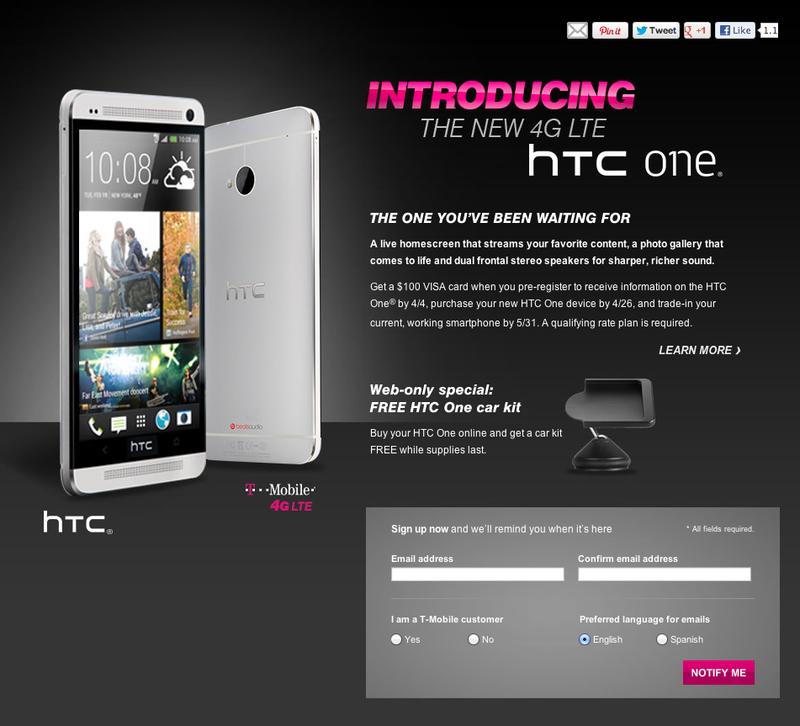 Speaking of the HTC One this morning and its continued “hanging in the balance” release date, T-Mobile has updated the One sign-up page with a special offer. There’s no specific dates for the car kit offer, but the site does say it’s a “web-only special.” Unfortunately the dates listed on this image are in response to HTC’s trade-in offer for the $100 VISA gift card, so we can’t use it as a barometer for an official release date. Still, if you’re looking to snag a HTC One when it finally arrives on Magenta, keep in mind this special car kit available online. I still haven’t gotten a car kit for my One S. TMo doesn’t seem to carry them, and neither does the HTC online store; I’ve had to look in 3rd-party stores and haven’t spent the money yet. So they just sweetened the deal. My wife has a Galaxy 2, so let’s say they will give her a $100 trade (optimistic), + $100 Visa Card, this will make the HTC One about a $380 phone. Not bad. The gift card is the trade, you don’t get 2 trades. The $100 Visa card is the trade in. The $100 Visa card is provided through HTC, and requires you send in your old phone to HTC. oh crap, I thought this was in addition to the trade offer. At least they finally updated the dates on the sign up page. I wish they added an extra bonus for people trading in their HTC One S’s to get a HTC One. I mean it is their device, and it would show that those who had a HTC One S are kinda loyal to HTC. I would really prefer that than a car charger. $100 for my HTC One S, when I bought it for $600 really doesn’t satisfy me. Yes, I know value depreciates a lot over time, but $125-$150 would suffice as a trade-in value. I completely concur. I had the Sensation too myself. But I upgraded from that to the HTC One S.
Well, seeing as how “purchase your new HTC One device by 4/26” is one of the conditions to qualify for the $100 Visa card, that would imply that the release date is either on (if they’re sadistic) or before 4/26. Or are you suggesting that release date may no longer be realistic? This is why T-mobile is still a bit behind, even thou I am a loyal customer 2 other companies have announced release dates for the One and all they have is a “sign up” page…oooh ahhh, still no phone…just sayn. I’m Pretty sure that this Phone will come out on the 19th like everyone’s else’s version, they just haven’t said so yet because of the iPhone.. But my Chief concern is… will they offer the Black version.. that one looks SO MUCH Sleeker…..